The Sunlight Omnisense 9000 Quantitative Ultrasound Bone Sonometer enables ultrasound based osteoporosis screening at a touch. A robust device that features a cable-free touch-screen and a user-friendly interface, it is ideal for use in clinics or any other point of care with a heavy workload. User-friendly, accurate and non-invasive, the Omnisense 9000 device makes screening people at risk for osteoporosis or fractures fast and easy, allowing cost effective early assessment, diagnosis and monitoring. A robust, standalone device Omnisense 9000 is perfect for use in any walk-in clinic, pharmacy or physician’s office. Available with a choice of software modules and four ethnical clinical reference databases, it enables accurate bone screening of patients aged 0-99 years. Building on the proven Sunlight Omnisense technology, Omnisense 9000 is based on a panel PC computer with advanced hardware and software features. The all-in-one 19" touch-screen requires no cables or wires. Training videos embedded in the software enable a fast and easy ramp-up for new users. The updated, multi-module software offers a simple user-interface, easy and intuitive workflow, customizable reports and enhanced patient file management. Omnisense systems are the first – and only – multi-site ultrasound devices proven in thousands of installations worldwide. Clear, customizable, color-coded reports printed in A4 letter format. 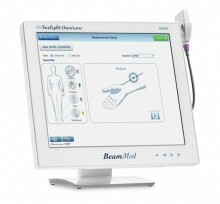 Click the button below to add the BeamMed Sunlight Omnisense 9000 Quantitative Ultrasound Bone Sonometer to your wish list.